International flags are waved during a procession during World Youth Day 2019 In-Sync. Image: Mary Brazell/Diocese of Parramatta. As the 171 Diocese of Parramatta pilgrims slept under the stars in Panama, waiting to celebrate the final Mass with Pope Francis, their family, friends and supporters back in Australia celebrated World Youth Day with them in Parramatta. 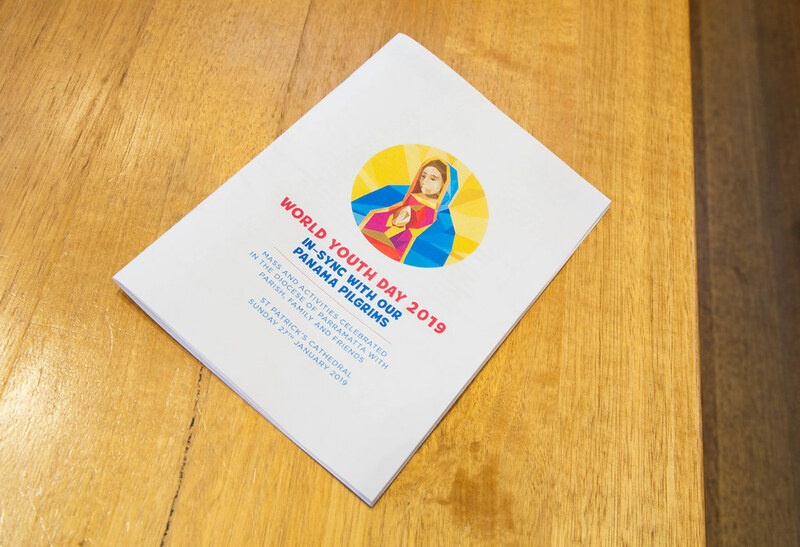 On Sunday January 27, the Diocese of Parramatta hosted the World Youth Day 2019 IN-Sync Mass and celebration as a connection with the pilgrims in Panama. Mass was celebrated at St Patrick’s Cathedral, Parramatta by Fr Paul Roberts, Director for the Institute for Mission, Diocese of Parramatta, and concelebrated by Fr Paul Marshall, parish priest at Our Lady, Queen of Peace Parish, Greystanes. During his homily, Fr Paul Roberts reflected on the words that Pope Francis had just given the pilgrims during the World Youth Day Vigil. “Over these past days, our pilgrims have enjoyed companionship, they’ve broken through barriers that often keep people from connecting with each other, they’ve been moved by the missionary initiatives of goodness that they’ve seen and shared, they’ve shared questions of faith, of life and priorities, of purpose, vision and hope,” Fr Paul said. Fr Paul Roberts delivers the homily during World Youth Day 2019 IN-Sync. Image: Mary Brazell/Diocese of Parramatta. “They’ve journeyed with Jesus each day, who whilst on his journey also addressed questions of life, priorities, of purpose, vision and hope. Fr Paul quoted Pope Francis’s advice that the worst flaw in life we can make, and the one that can ruin us, is to remain down and not let God’s love help us up. “So many times throughout the scriptures, we learn of a God who wants a relationship with us, who wants to hold any regret we might have, who doesn’t tire of wanting to embrace us again, even and especially when we say ‘I mucked it up,’” Fr Paul said. Following Mass, a procession of multicultural flags lead attendees from the Cathedral into the Cathedral Hall, as members of the Neocatechumenal Way community sung and danced in the Cathedral Cloister. Members of the Neocatechumenal Way community perform during World Youth Day 2019 IN-Sync. Image: Mary Brazell/Diocese of Parramatta. Dinner was then served as highlight videos, Australia Day well-wishes from international pilgrims and funny bloopers from the pilgrimage were shared with the attendees. Three Diocese of Parramatta pilgrims from World Youth Day 2016 in Krakow shared with the families and friends of the current pilgrims about how their lives were impacted then and now by their experiences. Vidya Jolly from St John XXIII Parish, Glenwood-Stanhope Gardens, said that it was through the pilgrimage that she saw God’s plan for her unfold. “Before World Youth Day, I wasn’t very involved in my parish or my community. I was under the impression that my faith would be able flourish whilst it was kept private. However, this all changed when I participated in World Youth Day. Vidya Jolly speaks during World Youth Day 2019 In-Sync. Image: Mary Brazell/Diocese of Parramatta. Roseanne Victoria, the mother of two of the Parramatta pilgrims, reflected on what it meant to her to allow her children to experience World Youth Day. “We know that our children, and all the children of the diocese, will return home from their pilgrim journey with a whole lot of different experiences, fresh knowledge, more tolerance and unique skills. As part of the IN-Sync event, parents and friends were able to record messages that would be played to the pilgrims during their post-World Youth Day retreat in Houston, Texas. A few tears were shed as messages of love, support, hope and faith united families and friends in the one shared experience. View the photos from World Youth Day IN-Sync here or click on the images below.